Added by Indo American News on January 22, 2015. From left: Raghu Nednur, Atul Kothari, Suresh Shah in Mahatma Gandhi dress, Apoorv Nednur (10), Veena Ponnaganti, Krishna Vavilala and Ariana Morales (10), Not in the picture: Anand Morales(8). HOUSTON: As in the previous years, FIS participated in MLK Grande parade on January 19 in Mid-town, Houston to celebrate Martin Luther King Jr.’s birthday. First time participants like Veena Ponnaganti, Apoorv Nednur (10), Ariana Morales (10) and Anand Morales (8) distributed fliers spreading the message of on-violence and Peace to the cheering crowds who lined up on both sides of the mile long parade route. 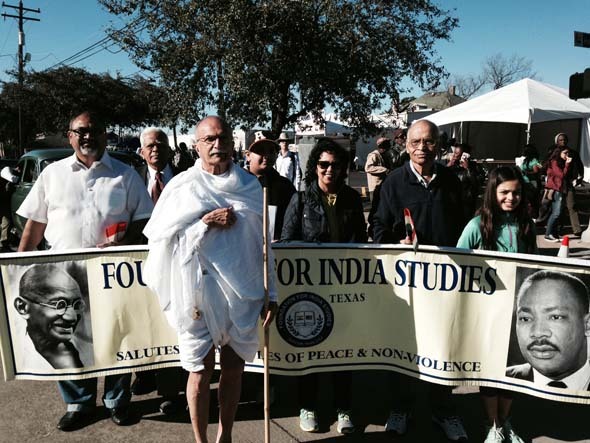 Under the gorgeous sunny morning skies, Suresh Shah of Kingwood donned the attire of Mahatma Gandhi and walked ahead of the FIS group. Dr. Martin Luther King Jr. had never met Gandhi ji even though he followed Gandhi ji’s philosophy of non-violence in his struggle for civil rights. Dr. King Jr. visited India in 1959 and was quoted as saying “It was a marvelous thing to see the amazing results of a non-violent campaign. The aftermath of hatred and bitterness that usually follows a violent campaign was found nowhere in India…” Later during a radio interview, he was quoted as saying that more than ever before, a non-violent campaign would be the most powerful weapon for oppressed people. It is hard to believe that only 50 years ago, separate drinking fountains for whites and blacks and separate balconies in movie theaters had existed and segregation was the order of the day. Thanks to Dr. MLK Jr.’s non-violent agitation, a Civil Rights Act was passed in 1968 under President Lyndon B. Johnson’s administration which ended racial segregation in schools and work places and unequal application of laws based on color. Both Gandhi ji and Dr. MLK Jr. preached and practiced non-violence, yet became victims of assassin’s bullets. For centuries, Indians and Blacks are victims of prejudices and discrimination. FIS chose to participate in the Annual MLK Parade as a mark of respect to Dr. Martin Luther King Jr.’s legacy and to demonstrate that both our communities have a common cause to work on. For more information, contact Krishna Vavilala, 713-795-5169.